This week I had a very strange case. 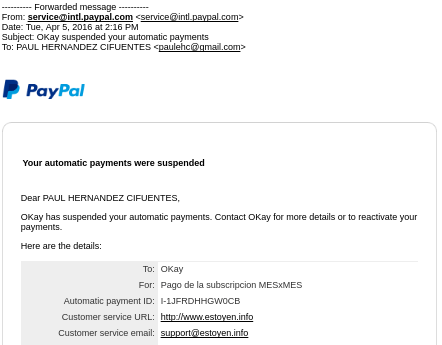 In the morning, I got an email saying that one of my customers has cancelled his PayPal subscriptions (AKA automatic payment). I thought that was okay, this kind of things happens. But my surprise was the next day when I get an email from him (my customer) asking why subscription was cancelled and if there was any kind of problem. Of course, I answered him I didn't suspend his subscription. The issue here is I didn't cancel my customer subscription! Why in this world I would cancel someone who is paying me? PayPal is lying. I just post this as an evidence of what happened.